An accountant who has been alleged to have ulterior motives as regards a video going viral on the social media as asserted. Kayode Fakolujo a chartered accountant and a fellow of the Institute of Chartered Accountants of Nigeria(ICAN) was a special guest at a wedding reception recently. A younger friend of Kayode – Mr Edun Kola (the groom) invited Kayode as a special guest with an invitation to attend his wedding. The quite Kayode who is also a farmer and a philanthropist attended the wedding reception on the 23rd December, 2018 at the Naval Dockyard on Ahmadu Bello Way, Victoria Island, Lagos. As our culture demands a special guest ,he stood to dance with the new couple on stage. To show his happiness and joy towards the marriage, Kayode Fakolujo who has known the groom for over 30years hugged the bride innocently while spraying her and this has been rummored on the social media to have sinister motives because he touched the dancing bride’s tummy while spraying her. The video which has gone viral was viewed by our correspondent and a sane mind will agree that rumour mongers must have been at work. 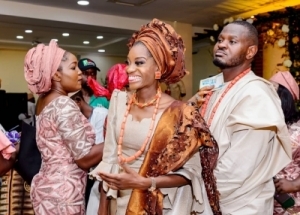 In a chat with the groom on Thursday 31st of January 2019, our correspondent gathered that Kola Edun who is the groom affirmed that the whole story “Is a lie. It’s not true. The accused – Mr Kayode Fakolujo is my brother”, he averred. It will be recalled that the federal government is doing everything possible to curb the spread of fake news and a law to back it up will be passed soon.